A few weeks ago, I received a message from someone excitedly telling me that she visited my ‘fennel lady’ in Malta. I often wrote about this lovely farmer, on the blog and in my cookbook, and I can’t imagine cooking without her aromatic harvest anymore. Every Sunday, she spreads her fennel and coriander seeds on the wooden table at a tiny stand at the farmers’ market in Marsaxlokk, a picturesque fishermen’s village in the south of my beloved Mediterranean island. It seems like this is what she’s done all her life, picking and selling seeds, always with a happy smile on her tanned face. The person who wrote me the email did what I always do in summer: she bought bags of fragrant seeds to fill the spice box in her pantry. Malta is the reason why fennel became so prominent in many of my recipes. It grows wild all over the islands, the plants dig their sturdy roots into every patch of soil they can find. I guess its abundance is one of the reasons why you can find fennel in many traditional dishes in Malta’s Mediterranean cuisine – and its wonderful sweet taste of course. If you visit the small local restaurants, you often find baked fennel potatoes as a side dish on the menu. 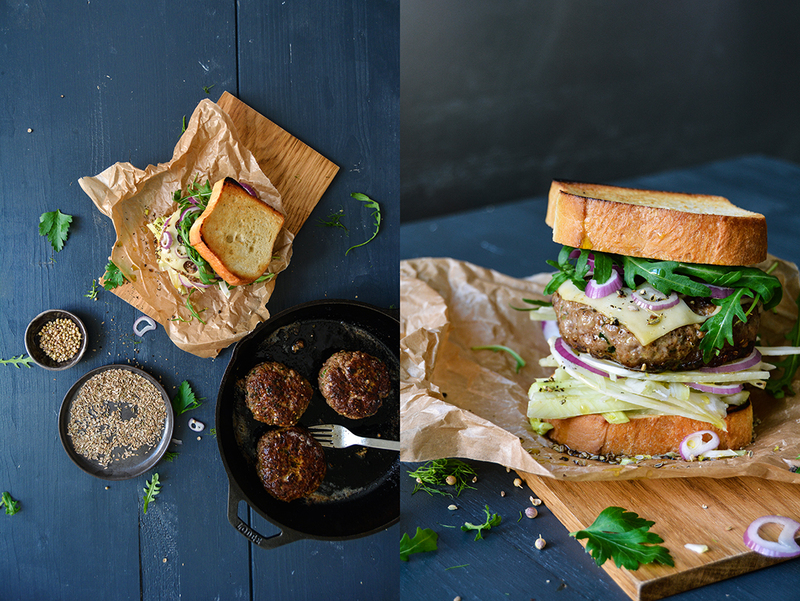 When Leerdammer asked me if I’d like to create a recipe with their new Toast and Burger Cheese, I didn’t think twice. I love a good cheeseburger. I live in Berlin, a city where new burger joints pop up at every street corner like mushrooms. Although I like to try a new spot once in a while, I still have my favourite place when my meaty cravings creep over: The Bird. I always go for a perfectly cooked steak burger topped with a slice of Swiss cheese. However, in my own kitchen, I’m a little more experimental. Leerdammer’s aromatic cheese tastes slightly sweet and it melts on top of a warm, juicy burger like butter. 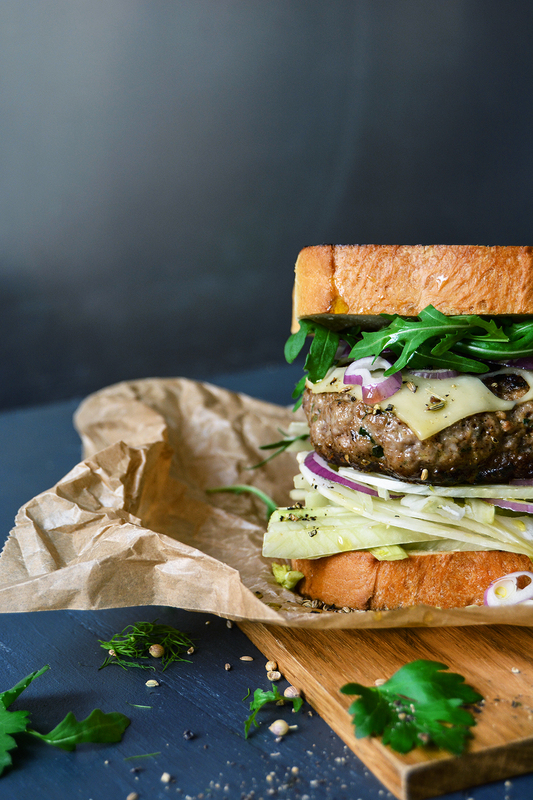 The cheese has a fine taste, but it’s not shy, it can easily take a generous amount of warming spices stirred into the burger mixture: fennel and coriander seeds, alongside lots of garlic, fresh parsley, and spicy black peppercorns crushed in a mortar. I felt inspired by the famous Maltese sausage, which is coarse, rough, and so tasty. It features all the spices that you can find in my burger. When it comes to flavour, Malta’s traditional sausage is one of the richest and most delicious I know. And what works in a sausage, can’t go wrong in a burger. 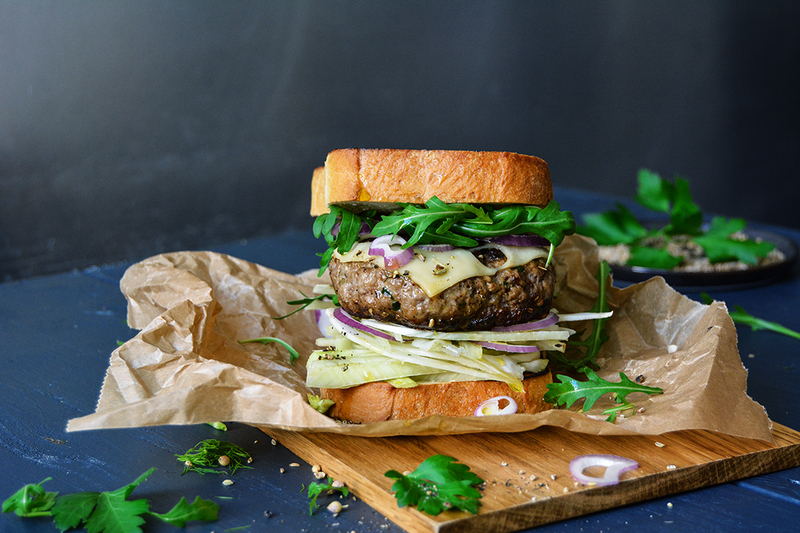 The burgers are bedded on a thinly sliced fennel bulb that adds freshness and crunch, a few red onion rings and arugula (rucola) instead of a lettuce leaf brings a sharp note. Usually, I prefer to buy my cheese in one piece, but when it comes to cheeseburgers, I don’t mind working with sliced dairy products. This way it looks like a proper American style burger, one with a Mediterranean make-over. You could pack the whole thing in a bun, but what about trying something new and layering it between two thick slices of toasted white bread? And instead of using the toaster, make use of the burgers’ buttery cooking juices and crisp the bread in the pan. Thank you Leerdammer for inspiring me to make a Maltese cheeseburger toast. 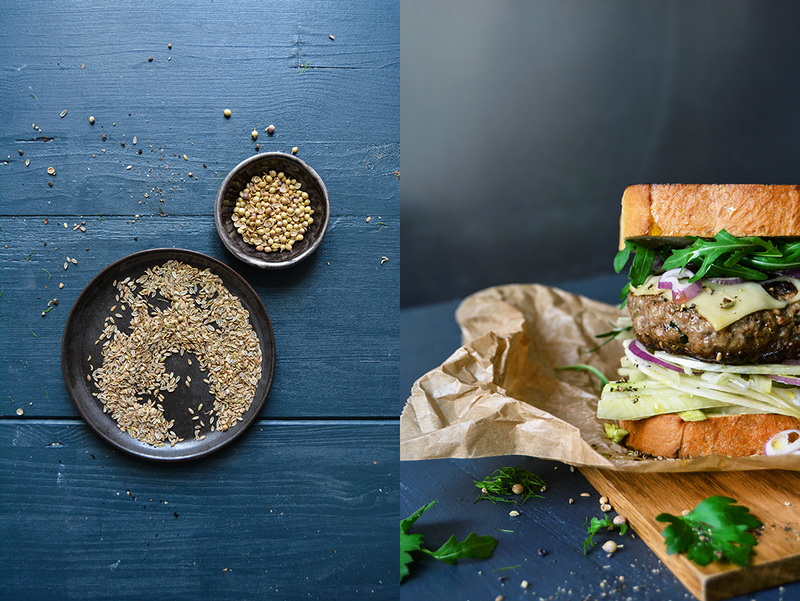 You can find more Toast & Burger recipes celebrating regional treats here. 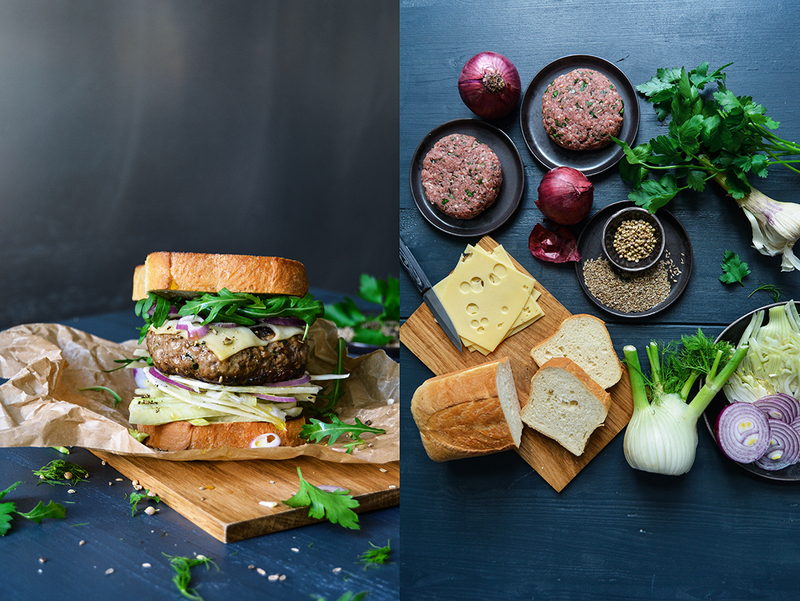 For the burgers, in a large bowl, using your hands or a stand mixer, mix and knead the minced meat, breadcrumbs, egg, garlic, parsley, fennel seeds, coriander seeds, pepper, and salt until well combined. Shape the meat mixture into 4 thick burgers. In a large, heavy pan, heat 1 tablespoon of butter and a generous splash of olive oil over high heat. Reduce the heat to medium-high, add the burgers, and, turning them 2-3 times, cook until medium rare. You might have to turn the heat down to medium after a few minutes if the burgers turn dark. This takes about 10 minutes. Add more oil if the pan becomes too dry. Transfer the burgers to a plate (cover them with a lid), leaving the fat in the pan, and turn the heat up to high. Add the bread slices to the pan and toast each slice on just one side until golden and charred at the corners. 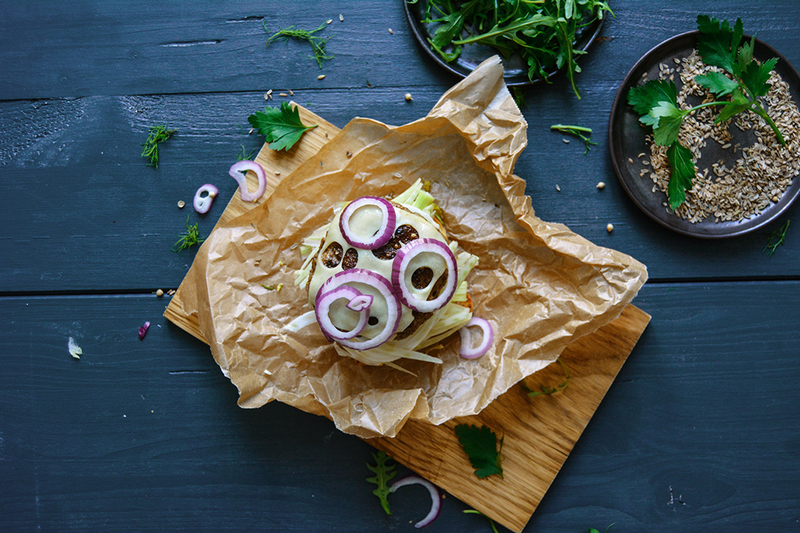 To assemble the burger, lay a slice of bread on a plate (toasted side facing down) and lay a few fennel slices and red onion rings on top. 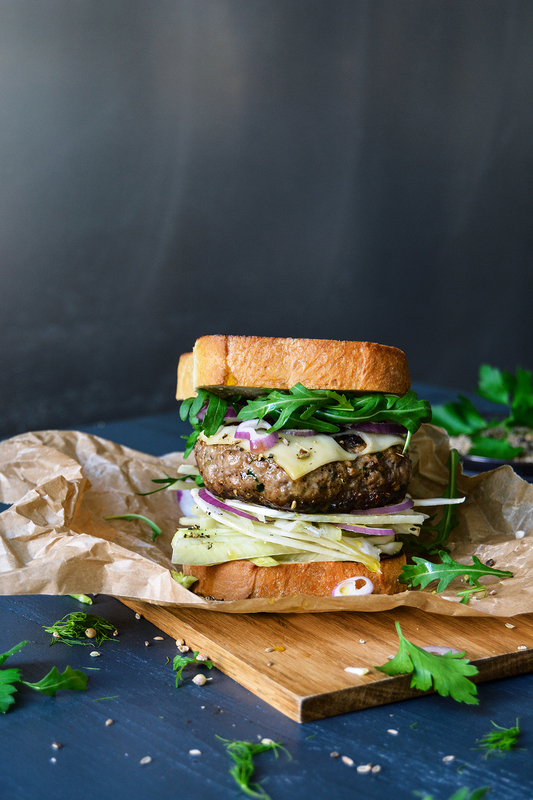 Arrange the warm burger and a slice of cheese on top, then finish it off with some more onion rings and a few rucola leaves. Drizzle with a little olive oil, sprinkle with some fennel seeds, and close the sandwich with a slice of bread (toasted side facing upwards). Squeeze and enjoy!